Unlike most dog clothes and accessories, dog boots are not plainly a fashion thing. Although most dogs do not like any additional clothing on them, overall, dog shoes tend to be the least frustrating for them. There are many things that should be considered before purchasing a new pair (a set of 4, in most cases) of trendy shoes for dogs that have nothing to do with the fashion but many other factors. We would like to guide you through with in-depth analysis of what kind of considerations should be taken into account. Afterwards, we will provide our top picks for each category so that you can find the best dog shoes for your individual fella. Although you could divide them into different subcategories based on their features, dog boots can mainly be divided into three major categories – winter boots, summer boots, and climbing/hiking boots. Winter dog boots are designed to serve as an insulation for your dog’s feet from cold, snow, ice, salt, and also damp. As their “title” suggests, they (should) feature such qualities that serve their purpose best in the winter season. Summer dog boots protect your fella’s paws from the heat of pavement or asphalt in general, as well as hot sand and other surfaces in summer. As the “title” suggests, they (should) feature such qualities that serve their purpose best in the summer season. Climbing/hiking dog boots are designed to shield your companion from such dangers as sharp rock, brambles, maybe even cacti. They can be used in various seasons but bear in mind that different hiking shoes will have different qualities which mean they will be more applicable for a certain season. In general, they are intended for longer and more challenging activities than just daily walks on a flat pavement (either hot or covered with snow). Now, note that there are certain dog shoes that can be used in more than just one, if not all, seasons. However, as you may know, what works for all, excels only by being “universal”, isn’t the best for a certain thing (activity). Therefore, we have chosen certain boots that we consider one of the best within each category. Some of them may also work for different seasons and various terrains – pay close attention to their descriptions and our testimonials, and that way you’ll make sure you choose the most suitable ones for your four-legged fella. What to look for in the new pair of dog boots? We will explain the details for each type of dog boots in the lists below, yet, bear in mind that there is one common quality feature that is a must for all of them – they must stay on! There is practically no point in buying such dog shoes that simply wouldn’t stay on when a dog starts moving around. The shoe must fit well on your companion’s paw. There’s an ongoing challenge in the market for pet owners when choosing the appropriate size as the manufacturers measure them differently – some take the measurements from the heel of the pad to the tip of the toe, some others include the toenail length in the size as well, and others – even by dog’s weight. Now, the last one is a rather unreliable method since the weight can vary quite drastically, and it wouldn’t correspond to the paw. In our opinion, the second method that we mentioned is the most solid one. To avoid picking the wrong size, see for the specific brand’s instructions on the measurements. Waterproof. The boots for winter should be made from water-resistant materials. Textured material. We recommend the material of the sole to be textured to ensure a good grip for traction. Sole flexibility. The sole of the shoe must be relatively flexible so your dog can walk freely. Also, it’s good to have adjustable straps for a better comfort. Your dog, most likely, won’t really like any accessories put on initially, therefore, it’s smart to get both comfortable and durable shoes to serve in a long-term. HM tip: As some dogs tend to dislike the accessories, it’s a good idea to start practicing already at home so that your fella gets used to these “foreign objects”. Adjust them accordingly, give a solid tryout, and you’re set to go! These water resistant dog shoes with reflective Velcro and rugged anti-slip sole come in 8 different sizes and have many qualities that make it our choice No. 1 for the winter season. Truth be told, it meets every single requirement we discussed when it comes to choosing the best winter dog booties – they rugged sole for better grip of traction providing also a great stability, they are waterproof dog boots keeping the paws dry, and they’re also quite comfortable (for medium and large breeds) and easy to put on, and good at staying on when an appropriate size is chosen! Speaking of the measurements, the manufacturer offers 8 different sizes, and you can rely on the size charts provided on Amazon. Overall, these dog shoes are made of quality fabric making them more durable than most its counterparts on the market. Also, for more picky and fashionable pet owners, it is possible to choose from 4 different colors – black, green, orange, and red. Furthermore, they feature nice reflective Velcro strip for practical purposes – a better visibility at night. HM tip: Consider these the best winter dog boots unless you own a smaller breed with sensitive paws and still intend to go on longer walks (see the table of advantages and disadvantages above); Otherwise, they really stand out in the market of dog shoes if snowy winter is the season you’re aiming for. These dog boots are known for such qualities as good traction and for staying on really well providing the necessary support and control – this is very important in winter, especially for senior dogs that may also have some hip condition. The quality Velcro straps have a lot to do with this – the top opening allows to put them on easily and the straps ensure that they won’t slide off after a while. At the same time, they are quite flexible and comfortable to wear. Ultra Paws dog boots are also water-resistant though we would not call’em 100% waterproof – the bottom leather may get wet eventually if they are used in according conditions. However, we still believe they make very solid dog booties for winter and snow, and, overall, they are actually more flexible than our pick No. 1 both literally and in a sense that they are not well suited only for winter and snow (doesn’t help them in our rankings within the winter category though). HM tip: Consider these dog boots if, first of all, one of the 4 sizes fit your companion’s paws, second, you want to allow a bit more flexibility and also use them for other seasons when hiking and engaging in other outdoors activities. They’re definitely more comfortable for smaller breeds than our pick No. 1. A cheaper alternative to our first two picks, these dogs shoes are good or at least decent in all main criteria when it comes to picking dog boots for the cold season – they are water-resistant and stay on well. Suitable for both snow and rainy days, they also have the added value of being usable safely at nights as they have a reflective material for better visibility. Overall, they provide a decent comfort and stability on a slippery surface. Although you can choose from 5 different sizes, you have to take into account that they are essentially intended for medium and large-sized dog breeds. For the winter season, we suggest our pick No. 2 for very small breeds (or the alternative – dog socks reviewed below). Some customers have complained about a wrong sizing chart, however, please pay attention to the note about the measurements – the size is the size you find inside the boots, not the outside. HM tip: Consider this an excellent budget option if 1) you have a medium to large breed, 2) your dog isn’t the most playful beast and active runner as these boots do tend to loosen up and even fall off after some time. Good ventilation. Just like summer boots, they should provide a solid ventilation for the paws. Good protection from hot pavement and sand. Also salt, and water-resistance is also a good feature to have. Comfort. In hot summer days, it is especially important that your pup’s paws breathe and feel comfortable in the shoes. We start off our summer dog boot list with one that stands out for its quality, comfort, and suitability for various weather conditions. Muttluks have also ensured that your dog will be visible at night by adding the reflective strap feature. The strap itself allows adjusting the boot to your dog’s paws very easily while providing both secure fit and comfort. We also like the adjustable and stretchy leg cuff this product has. They come in different sizes and two colors (black and yellow/black). Overall, these are definitely one of the best summer dog boots for hot pavement, salt, hot and raw sand, and they stay on quite well (though could be a bit better for a very active dog also taking into account its price). They can be used in winter and snow as well, however, the aforementioned list of winter boots would undeniably be more suitable and applicable for various conditions in that season. HM tip: We definitely see these as one of the best summer dog boots for hot pavement and sand, and we really appreciate the feature of the longer and stretchier leg cuff that covers more of your fella’s paw. If you do too, we encourage you considering this pick in the summer season. If you live in an area where it’s raining almost on daily basis, these dog boots are an excellent choice for you. Bark Brite Paw Protectors have great traction on wet surface so that your dog doesn’t slip. What we really like about this model, they really do conform and cling to your dog’s paws providing the natural shape. As almost every quality dog boots, they also feature reflective material – two straps in this case. Definitely the best water dog shoes for summer. Regards hot pavement and sand, they’re also okay (as all summer dog boots should be) but they do seem to lose to our pick No. 1 as the material and ventilation aren’t as good as the aforementioned counterpart (still decent, though). HM tip: Consider Bark Brite Paw Protectors the best summer dog boots for wet surfaces. Also, given its price right now, we’d call it the best price-for-value within the category. Another considerable option for summer, Petacc Dog Shoes are a cheaper alternative to the previous picks while also providing most of the requirements – they provide decent ventilation, are somewhat water-resistant, and rather comfortable to wear. They come in different size and will fit well if an appropriate size is chosen. They serve their purpose on hot pavement as well; Could be longer (as our previous pick) to fit better on sand (and snow, for that matter). Can be used for running and hiking, though there are certainly better options for the latter. HM tip: Consider these all-around good dog boots for summer that don’t excel in a certain area but serve well enough for the most part. Definitely one of the best and universal for its price. Stay on well. It’s crucial when walking and climbing in various hazardous areas that the boots can endure different terrains and stay on your pup’s paws. Sole flexibility. Also, the sole of the shoe must be relatively flexible so your dog can walk freely. Durability. Hiking and climbing the mountains can be one of the most demanding activities not just for us and our companions but also the footwear. We advise you get boots for dogs made from a solid material that provides both comfort and sturdiness. It’s important to choose boots that provide great support and allow your fella’s paws to stay healthy. Longer walks and climbs can be very challenging and many dog shoes are not an advisable option for such cases. First, we’d like to point out the great flexibility and traction of these dog boots – Grip Trex feature a Vibram non-marking outsole constructed with a rugged design which ensures that your dog is supported with optimal traction while also having the ability to move freely in them. Secondly, they provide excellent ventilation that allows your dog’s paws to breathe. Ruffwear has ensured that these dog boots are suitable for various terrains, therefore, it’s hard to think of an outdoor activity where these boots wouldn’t work great on (except for the water, obviously). Of course, after a longer period of time and many extreme activities, they may start tearing off at some place but you won’t find such shoes that wouldn’t. Also, just like most quality dog boots, Ruffwear have added a reflective material for a better visibility at nighttime. In our opinion, overall, these are the best hiking dog boots, and the only real drawback we see is its relatively high price, and also you couldn’t call them waterproof (which is usually more important for winter boots). HM tip: Consider these the best hiking and climbing dog boots unless you intend to do a lot of these activities on a wet surface (since they are not waterproof). Other qualities really are top-notch. Since we pointed out our previous pick wasn’t made from waterproof material, we wanted to offer something that was and also was solid in other criteria. Yes, Paw4D have made a solid set of waterproof dog boots for hiking that also are suitable for various terrains, and for a much more attractive price. These boots also feature such things as reflective material and quality Velcro straps. Why isn’t this our pick No. 1? Well, there are a couple drawbacks. First off, they don’t stay on as well, even with the Velcro straps. Secondly, they are a bit less durable and, although decent, not as excellent traction as the counterpart, Ruffwear. Overall, they still make very solid dog boots that can be recommended for walks and mountain climbs in rainy days. 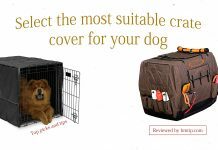 Note that they only come in 3 sizes – L, XL, and XXL -, therefore, suitable only for medium to large dog breeds. HM tip: Consider this the best price-for-value product within the category that is excellent for rainy conditions, and quite universal (can be used on various terrains and seasons/conditions), too. While these might be the most fashionable out of all our picks (e.g., they “light up” when your dog starts moving), Kurgo has also thought about the practical functionality of them. They are made of a durable rubber sole for optimal traction. This set of 4 has dual strap design that ensures a secure fit in such way minimizing the slipping, flipping and falling off. They actually offer quite respectable insulation, therefore, they can even be used for cold winter days or chilly mountains. Simultaneously, they can be used in summer as well as the comfort and ventilation allow it. However, speaking of the winter, they do tend to allow the snow get in after which it no longer matters how the material protects the paw from outside. Although they fit well and are relatively secure, they don’t stay on a very active runner as well as our pick No. 1. Also, similarly to our pick No. 1, you couldn’t really call these waterproof (though they do provide some water-resistance). Ending with a positive note, we appreciate the lifetime warranty for manufacturer’s defects meaning you will always get a proper set of boots from an authorized dealer. HM tip: Consider this a good and less expensive alternative to our pick No. 1 – more or less, it meets all the main criteria and features similar qualities. Might also be more appealing to folks who enjoy some fashionable features in their pet’s accessories (Step n Strobe feature). 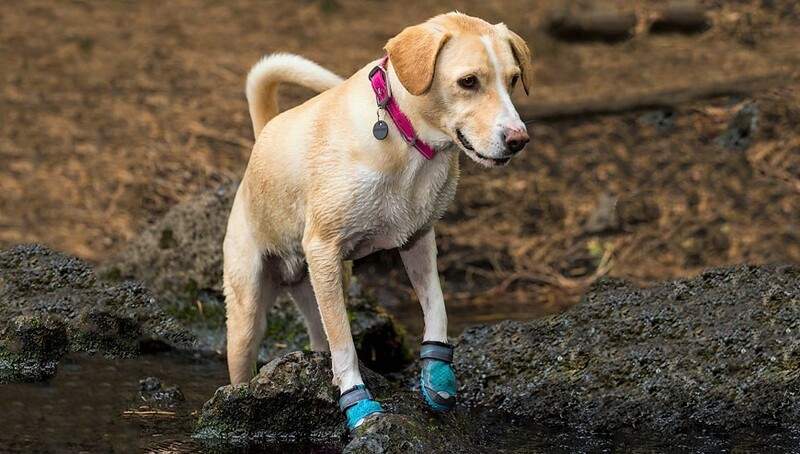 If you want to allow your dog paws more comfort and freedom, consider Pawz Water-proof dog boots as they are more of socks than shoes or boots in reality. Obviously, they will not have the hard sole some other winter boots have for paw protection, yet, it still provides a solid support in this matter, as well as a decent traction. The manufacturer claims that materials used are all natural, and they are made in the USA. It also comes in various sizes and colors, therefore, it shouldn’t be an issue finding one that suits your individual. Water-resistance is also very solid, and they are disposable and reusable. They are easy to put on and stay on quite good, too, and are suited for all seasons. Of course, they won’t beat some exceptional dog boots mentioned in the top for certain criteria (not as durable and protective), however, in combination with the aforementioned qualities, we consider these the best dog socks available in the market for a very reasonable price. Additionally, you may consider checking out Musher’s Secret Natural Paw Protection product that can serve as a decent protection and also a healing salve for those raw spots of your companion’s paws. 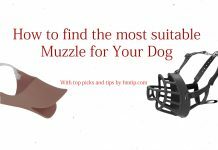 It’s inexpensive, and especially useful if your dog can’t get used to wearing dog shoes – your companion won’t even notice it’s there. It is easy to apply, and this moisturizer is especially good to protect against sand rawness while also providing Vitamin E and helping to keep the pup’s paws healthy. We have given you some very solid choices for different purposes. Now, it’s your job now to choose the best dog shoes for your individual fella based on our in-depth analysis and reviews. If that’s still not enough to decide, make sure you drop us a message and describe your situation – we’ll gladly assist you individually if you struggle to make the right choice in order to provide the best option for your dear friend.